The Carina Nebula, one of the largest and brightest nebulae in the night sky, has been beautifully imaged by ESO's VISTA telescope at the Paranal Observatory in Chile. By observing in infrared light, VISTA has peered through the hot gas and dark dust enshrouding the nebula to show us myriad stars, both newborn and in their death throes. The massive stars in the interior of this cosmic bubble emit intense radiation that causes the surrounding gas to glow. By contrast, other regions of the nebula contain dark pillars of dust cloaking newborn stars. There's a battle raging between stars and dust in the Carina Nebula, and the newly formed stars are winning—they produce high-energy radiation and stellar winds which evaporate and disperse the dusty stellar nurseries in which they formed. Within this intriguing nebula, Eta Carinae takes pride of place as the most peculiar star system. This stellar behemoth—a curious form of stellar binary— is the most energetic star system in this region and was one of the brightest objects in the sky in the 1830s. It has since faded dramatically and is reaching the end of its life, but remains one of the most massive and luminous star systems in the Milky Way. Eta Carinae can be seen in this image as part of the bright patch of light just above the point of the "V" shape made by the dust clouds. Directly to the right of Eta Carinae is the relatively small Keyhole Nebula—a small, dense cloud of cold molecules and gas within the Carina Nebula—which hosts several massive stars, and whose appearance has also changed drastically over recent centuries. The Carina Nebula was discovered from the Cape of Good Hope by Nicolas Louis de Lacaille in the 1750s and a huge number of images have been taken of it since then. 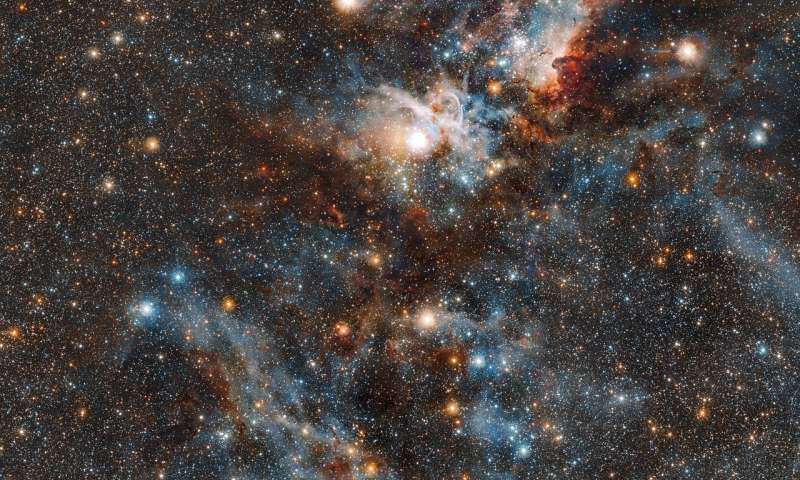 But VISTA—the Visible and Infrared Survey Telescope for Astronomy—adds an unprecedentedly detailed view over a large area; its infrared vision is perfect for revealing the agglomerations of young stars hidden within the dusty material snaking through the Carina Nebula. In 2014, VISTA was used to pinpoint nearly five million individual sources of infrared light within this nebula, revealing the vast extent of this stellar breeding ground. VISTA is the world's largest infrared telescope dedicated to surveys and its large mirror, wide field of view and exquisitely sensitive detectors enable astronomers to unveil a completely new view of the southern sky. "....the Carina Nebula is a dynamic, evolving cloud of thinly spread interstellar gas and dust. The massive stars in the interior of this cosmic bubble emit intense radiation that causes the surrounding gas to glow. By contrast, other regions of the nebula contain dark pillars of dust cloaking newborn stars." How does an evolving thin cloud of dust & gas create MASSIVE newborn stars? Benni, you are the one confusing the "massive" stars of the interior of this formation. With the "newborn" stars lurking in the dust pillars. Undoubtedly, some of those newborn stars will eventually evolve into stellar giants, in their own right. But that is not what this article is about. I would speculate that we are observing the effects of two major events. The older stars (by ten to a hundred million years?) have reached their giant phase. Sloughing off a series of elemental shells, producing the Carina Nebulae. Probably re-occurring nova and supernova events. While the smaller, newborn stars ( a few million years old or younger?) are just starting the process. From out of the materials ejected by the earlier stars. In a boisterous brew of gases, plasma, dust and debris percolated up by conflicting shock waves. Think of it as the difference between flying a plane into the eye of a hurricane. And trying to fly into a tornado! ..a boisterous brew of gases, plasma, dust and debris percolated up by conflicting shock waves. A nicely poetic description. Accurate too. Thank you. But I would also note that the most massive stars form FIRST. So the stars in the pillars are likely to be lower mass stars. Unfortunately for those of us living in the north, it lies 60 degrees below the celestial equator, so is visible only from the Southern Hemisphere. Horsepucky. Simple geometry (ignoring horizon effects and refraction in the atmosphere) shows that it would be visible as far as 30 degrees North. RNP, the way I understand it, the "Older" stars have had the time to agglomerate more material. However, it would consist of simpler elements racing through their stellar life-cycles. Much of the debris blown off becomes the "Newer" stars, still in their infancy. With a witches-brew of heavier elements. Eventually, a number of these youngsters will grow into giants and age and blow out the materials for next generation of stars. Benni, I suspect that that dust "Lazily floating around"? Will tuern out to be stellar equivalent similar to a combination of the phenomenons of sandstorms and electrical storms. With a plethora of brutally torrid chaos of colliding shells and wavefronts. barakn, "could" be visible does not mean it is reliably visible north of the equator. What season of the year would such observations be possible at 30 degrees? And how often disappointed by seasonally inconvenient weather?